Indian Institute of Management Indore is celebrating the National Road Safety Week from February 04-10, 2019. 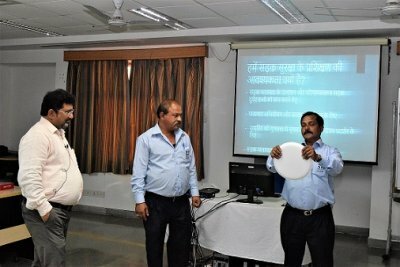 Mr. Jigar Kantharia, Safety Officer of the Institute conducted a Road Safety Workshop (Driver Sensitization Programme) on February 06, 2019. The programme aimed to raise awareness about safe driving techniques, reduce road traffic violations, and reduce fatigue among drivers; along with improving driving quality and performance of vehicles. Mr. Kantharia used examples from the Mahabharata and real-life stories to depict the importance of safe driving. The programme was attended by the drivers and support staff of the Transport Department. 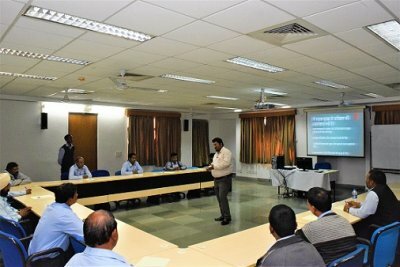 The programme concluded with a pledge on adhering to the safe driving techniques.